This slide is a total RUSH! 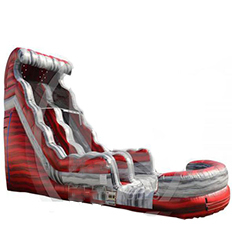 Description: The 16 foot tall Lava Rush is a NEW addition to the KidZone KC inflatable slide line up. Climb up 16 feet, careen down a super fast slide! 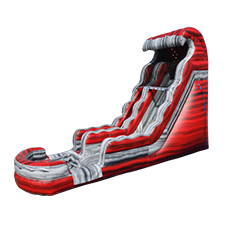 Guests both young and old will love the new Lava Rush slide! This slide may be used wet or dry. Requirements: Inflatable requires a relatively flat surface about 33ft x 16ft within 100 feet of an electrical outlet. We prefer to set the inflatables up on grass, but concrete or asphalt is acceptable as well. Sticks and rocks must be cleared from the area before we arrive. 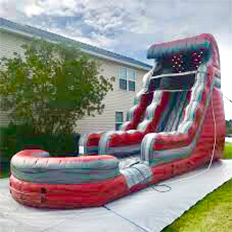 The inflatable slide may be set up dry indoors if you have an auditorium or gymnasium available at a nearby church or school.